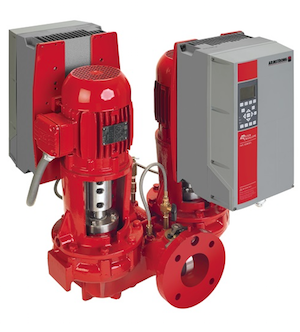 Armstrong 4302 Vertical In-Line Pump Units Are Built To Order. We can normally have these built and ready to ship in 2-3 days. Please provide us pictures of the data plate if available and all the specs on your current pump. Sales@NationalPumpSupply.com. The Armstrong 4302 vertical in-line pump units are used for HVAC system pumping; general purpose pumping; industrial/process pumping (water or glycol based). Pipe-mounted 2-pump unit with integrated intelligent controls for space-saving installation, superior energy performance, and duty/standby or parallel-pumping operation. Saves up to 75% in energy over comparable traditional constant speed or variable frequency operated pump installations. They are constructed of Cast iron or ductile iron casing, cast iron or bronze impeller, sintered silicon carbide mechanical seal. On-board Intelligent Variable Speed controls with Sensorless or Parallel Sensorless control. Controls enclosure UL type 12 or UL type 4X (outdoor applications). Available with NEMA premium motors. Outside balanced or inside single spring mechanical seal.